The school runs its own school meals service. Staffed by our highly skilled team, the children can choose from a number of menu options. There is our hot meals choice, which provides a balanced, healthy and nutritious lunch at a competitive price. The children can also choose to eat our jacket potato (with a variety of fillings) option or our Count to Five Selection. 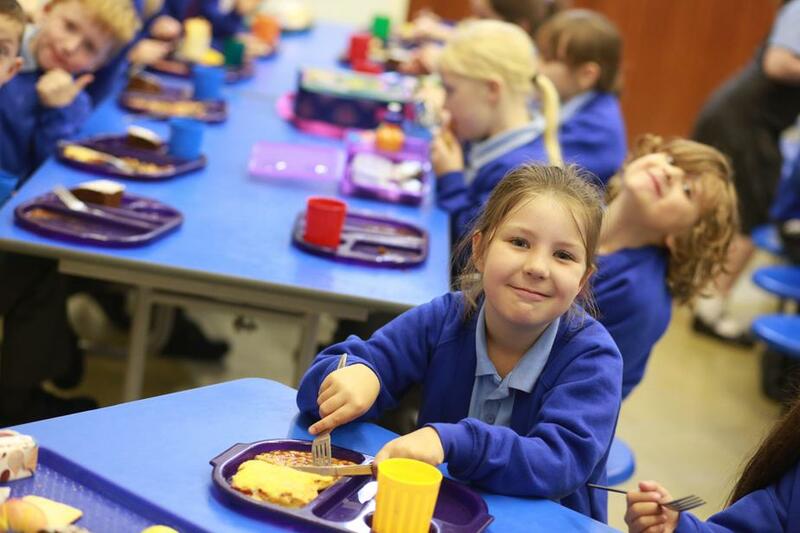 Meals are priced at £2 a day for pupils in Key Stage Two. Under the Universal Free School meals scheme all Reception and Key Stage One children eat for FREE. Some children in Key Stage Two are also entitled to free school meals. Our latest food menu can be downloaded by clicking the link at the bottom of the page. We aim to provide a school meal for ALL pupils, including those with medical diets. Allergy information is available on request. These special diets are for pupils with a medical problem, not just a dislike of certain foods. You will need to tell us that your child has an allergy and also provide medical evidence. For example, a letter from their GP or consultant paediatrician, together with any information received from their dietician. Our school meals service is inclusive and we do not discriminate against children on the grounds of religion, illness or disability. We have an open door policy for all parents. Fancy coming in for lunch with your child? Just pay £2.40 and choose what you want to eat from our menu. Please order your meal BEFORE 10am.